Royal service need not only be reserved for royalty. Step into the Victorian era of grace and beauty. Welcome to Mountbatten Bungalow Sri Lanka. Once the alleged Kandy Residence of Lord Mountbatten, this century old bungalow is one of the most sought after bungalows in Kandy. 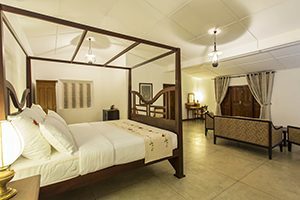 Mountbatten Bungalow is one of the most spacious holiday bungalows in Kandy that offers 2 Suites and 4 Bungalow rooms. The rooms are spacious and exude a gentle nostalgia of days gone by. Hand embroidered pillows, muslin draped canopy four-posters and queen sized beds lend an old world charm to the spacious bed-chambers. These enormous rooms provide the ideal Kandy bungalow accommodation, beautifully fitted out in furnishings fitting the era. The cut and polished original cement floors are buffed to perfection. The spacious bathrooms colour scheme is suggestive of the late Victorian era. 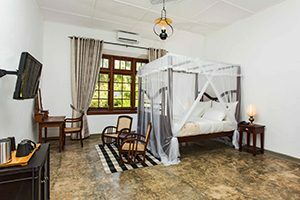 Both Suites as well as Bungalow Room bathrooms are, as per traditional Victorian style, painted in a monochrome colour scheme. The fittings are however, ultra-modern and luxurious; a cunning blend of old and new. The dining room was the second-most important room in the Victorian house. 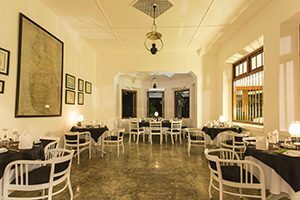 The walls were often the focal point of the dining room and very ornately decorated, making dining in Kandy a truly surreal experience. This large room of this Kandy boutique hotel is beautifully fitted out with brass overhead diffused lighting. The cut and polished original cement floors are buffed to perfection. The overall decor of the dining hall is understated compared to many Victorian dining halls. This is due to the stunning views available from the large windows that frame one wall of the dining area. Be it High Tea or an Englishman’s dinner of steak and potato; explore a banquet that will dazzle your taste buds. The most widely consumed beverage in the world, after water, is tea. This herbal drink has been known to have great health benefits. These benefits can now be enjoyed not only by drinking the hot or cold beverage, but even while relaxing in a posh urban resort setting. The Tea Spa Kandy has an exclusive range of treatments based on the therapeutic properties of tea. Tea based essential oils are used in massage as well as other treatments at our exclusive Kandy bungalow in Sri Lanka. Mountbatten Bungalow has two tea gardens and it is only natural that this abundant resource is harnessed to provide our uber-modern guests with the best and most exclusive of tea spa service. Tea not grown in the estate-gardens are carefully sourced to meet the exacting quality standards.